During the lazy days of summer we want to be, well, lazy. But we still want to entertain. So we look for dishes that are easy to make, preferably ones we can prepare ahead of time. Enter these Italian-style marinated mushrooms. Flavored with olive oil, lemon, and vinegar, they make a wonderful appetizer or side dish. And they taste better when made several hours ahead, or even the day before serving. They’re also delicious when cold or at room temperature – so they’re perfect for the picnic table. Plus they taste really good! Kind of addictive, actually. Magic mushrooms, you might say. This dish (and its close relations) can be found throughout the Mediterranean region, although it may be most popular in Italy. There are countless recipes for marinated mushrooms. Ours is based on one by Martha Rose Shulman, from her wonderful cookbook Mediterranean Harvest. It takes no more than half an hour to make this dish. Then you’ll want to let the flavors mingle together in the refrigerator for at least an hour. Better yet, overnight. This recipe yields enough appetizer-size servings for about 8 people (or half that number if serving it as a side). Wipe any dirt off the mushrooms with a damp paper towel. If the mushrooms are small, you can leave them whole. If they’re medium-sized or large, cut them into halves or quarters. Set aside. Peel the garlic and mince it finely. Set aside. 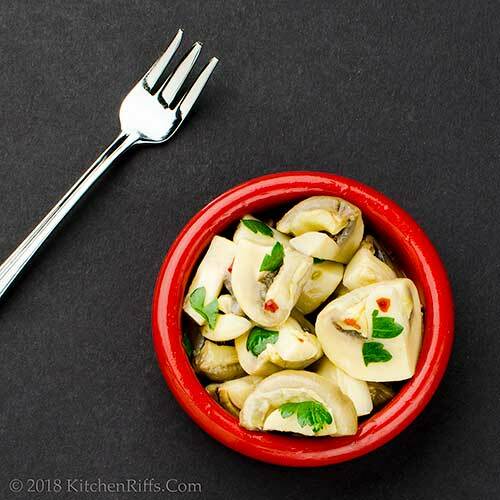 Cook this dish in a large, nonreactive skillet: Add the minced garlic to the skillet along with the olive oil, lemon juice, water, vinegar, black pepper, salt, and red pepper flakes. Bring the mixture to a simmer, cover, and cook for 15 minutes. Add the mushrooms to the skillet and return to a simmer. Cook, turning once, until the mushrooms are tender – about 5 minutes (depending on size). When done, remove the skillet from the heat and let the mushrooms cool in the liquid. When cool, pour the contents of the skillet into a nonreactive container (we like to use a Corning Ware bowl with a lid). Cover the container and refrigerate for at least 1 hour, preferably overnight. When ready to serve, wash and stem the parsley. Chop it roughly, then combine it with the mushroom mixture. 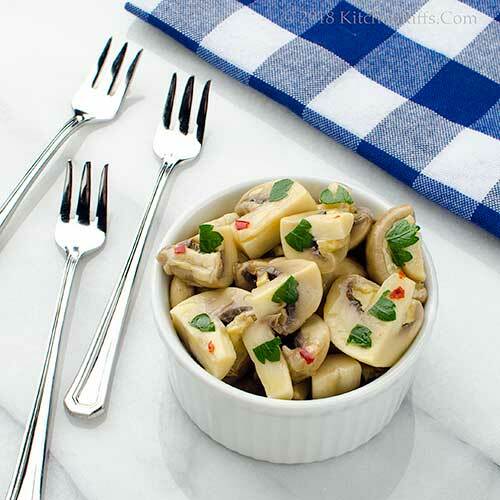 Remove the mushrooms from their container with a slotted spoon and place them in a serving dish. Sprinkle a bit more parsley on top if you wish. We usually serve this dish with small forks, but toothpicks work equally well. What kind of mushrooms to use in this dish? Any variety will work, although we prefer the ordinary white ones. Baby portobellos are a good choice, too. Stem the mushrooms or not? Your preference. We usually don’t. You can add fresh herbs to this dish if you’d like. Thyme or rosemary are particularly welcome. Use maybe a teaspoon or so. Oregano or marjoram would probably work too. What kind of vinegar works best? Any sort of mild wine vinegar. We prefer to use a white variety, and often opt for Champagne vinegar. Sherry vinegar would be nice, too. We’ve seen recipes for this dish that suggest adding capers. We haven’t tried that, but it sounds good. For cooking, we use kosher salt, which is about half as salty by volume as table salt. That’s because its crystals are larger and don’t pack a measure as tightly. If using regular table salt, start with about half as much as we recommend. But always season to your taste, not ours. 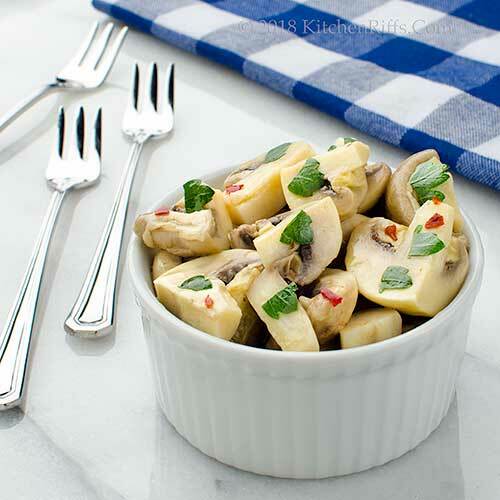 “Plus, I don’t need to dig out my old tie-dyed jeans to enjoy them,” said Mrs K R.
I have a recipe for pickled mushrooms that is similar to this and they're SO GOOD. But mine doesn't use red pepper flakes--that sounds like a necessary addition for next time :). These look great! Hi Kelsie, the red pepper flakes add a tiny bit of heat. Which we always welcome. :-) Thanks for the comment. Yes, the Mediterranean food world is full of marinated mushrooms! I like the French version, which is called champignons à la Grecque -- meaning Greek mushrooms. They have tomato, coriander seeds, and cilantro, as well as your lemon and garlic. Great summer idea. Hi Mae, aren't these nice for summer? I've had champignons à la Grecque, but have never made them. I need to! Thanks for the comment. Addictive for sure, love, love mushrooms and this recipe is a must try. 5:00, G&T and mushrooms, yum!!! Thanks! Oh I have not eaten these marinated mushrooms in so long, thanks for reminding me of their existence and I<ll be trying this soon for sure. Magic mushrooms lol. I have never made marinated mushrooms. YUM! They look terrific John. Hi Pam, these are wonderful with cocktails! Ask us how we know. :-) Thanks for the comment. Hi Evelyne, I've had these on our list of stuff to make for the blog for years. Glad we finally got around to it. :-) Thanks for the comment. Hi Pam, these are a fun dish -- they really are terrific. Thanks for the comment. I adore mushrooms and actually just had some roasted for the lunch. Can't wait to try this marinated version. Thanks, John, for sharing another great treat. Mmmmm these are a perfect little snack to have while enjoying cocktails and waiting for dinner. Hi Angie, mushrooms are so tasty, aren't they? One of our favorites! Thanks for the comment. Hi Amy, heck, these could BE dinner! :-) Thanks for the comment. Perfect! I have a couple of marinated mushroom recipes and love them. Glad to find another version. This sounds perfect for summer—cold, fresh and earthy, with the tang of the lemon juice and vinegar. Must try this. Thanks! Hi Lea Ann, marinated mushrooms are good! Can never have enough recipes for them. :-) Thanks for the comment. Hi Terry, these are perfect summer fare -- full of flavor, easy to make. :-) Thanks for the comment. I imagine how flavorful these are and perfect for a cheese board. Hi Denise, these would be great on a cheese board! :-) Thanks for the comment. Hi Peachy, mushrooms have so much flavor, don't they? Thanks for the comment. Have not had this in ages so thanks so much for the reminder. Great dish to have about as it is a great side to dish to many dishes. The fresh citrus and sparkle to the dish is the taste I remember when growing up. yummy! I never get tired of mushrooms. For the first half of our marriage, my husband would never touch them but when I taught him how to hunt for chanterelles, he suddenly became a mushroom eater. 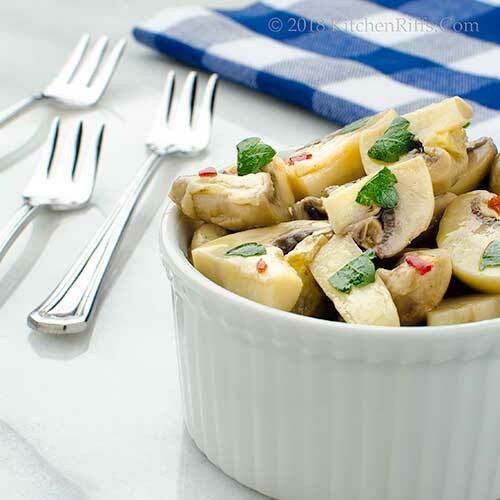 Your marinated mushrooms would be delightful with martinis on the porch. Thanks for sharing. Hi Bobbi, this is one of those dishes that used to be pretty popular, but I don't see it much these days. But so good! Thanks for the comment. Hi Dahn, mmm, chanterelles! Who wouldn't become a mushrooms eater with fresh wild chanterelles? :-) Thanks for the comment. Hi Velva, these are a great cocktail nibble! Thanks for the comment. Oh Yay! I've always want4ed to try marinating mushrooms and you have truly inspired me to quit procrastinating. These look quite delicious. Thanks John! Going to be making these soon. Thanks! Hi MJ, you're welcome. :-) You'll like these. Plus you can spice them up much more than I've done. :-) Thanks for the comment. Hi Anne, you'll love them! Thanks for the comment. I agree, this is a good dish for summer. HI Jeff, it is! :-) Thanks for the comment. These are wonderful - perfect for an antipasti platter. or is it antipasto? one is singular and one is plural, but I can never remember which is which. Anyway, this is the only way I'll eat chilled or room temp mushrooms! What's weird about me is ... I don't like mushrooms but I also like them. I am weird. Sometimes I dislike them but if they're accompanied by other things, they're okay. Shittake mushrooms and those other weird ones don't agree with me though. If they are snuck into my diet in some way... LIKE CLOCKWORK I will wake up at mid-night and throw up!! Hi Mimi, antipasti vs antipasto is a good question! I just looked it up -- antipasto is singular, antipasti plural. You'd think it'd be antipasti, but I always see it used as antipasto. Anyway, thanks for the comment. Hi GiGi, given your mushroom preferences, I'm betting you wouldn't like this! More for Landon. :-) Thanks for the comment. What a lovely dish for a picnic, I bet these mushrooms are so flavourful. Hi Emma, these really do have a nice flavor. They disappear quickly. :-) Thanks for the comment. I love marinated mushrooms but haven’t made them in years. Your recipe looks so good, thanks for reminding me. Hi Gerlinde, I know about the years part! This is a recipe we all know (at least a version of it), yet never make for some reason. Worth doing it again! Thanks for the comment. Salads for dinner are a big part of our summer menus. These scrumptious mushrooms would add a great pop of flavor to all those healthy greens. Hi Deb, there do indeed have a great pop of flavor! Good term. :-) Thanks for the comment. Hi Tricia, LOVE mushrooms! And this recipe really let's their flavor shine. :-) Thanks for the comment. Hi Sherry, heathens indeed! :-) Thanks for the comment. Oooh, I've never met a mushroom recipe I didn't love. And your marinated mushrooms sound incredible---I'd definitely toss in some capers! Hi Liz, marinated stuff is so excellent, isn't it? Mushrooms are exceptional when prepared that way! Thanks for the comment. I am imagining all the ways I can serve these mushrooms. Definitely my kind of recipe. Hi Laura, dishes like this are so versatile, aren't they? So many possibilities! Thanks for the comment. Perfect for munching along with some wine and cheese. Nice job! Hi Carolyn, better make a double batch -- you'll sneak at least one batch out of hand. :-) Thanks for the comment. Hi Lydia, these are perfect with wine and cheese. And/or cocktails. :-) Thanks for the comment. The perfect treat. I really love mushroom, these sound amazing. Hi Dawn, they're really good. :-) Thanks for the comment. Hi Greg, we hadn't made this recipe for years before we decided to do it for the blog. Well, actually we decided to make this for Memorial Day -- just because -- and then decided to put it on the blog. :-) Thanks for the comment. I love mushrooms but never think to turn them into a marinated salad. I love this idea. It's perfect for so many dishes or just to heat on its own. Great recipe! Mushrooms are my forever first love.Glad to find a wonderful recipe to make ahead. Hi Vicki, the Blogger platform can be a bit twitchy with comments sometimes. :-( Anyway, mushrooms have such a nice flavor! Love 'em. :-) Thanks for the comment. Hi Ansh, one can never have too many mushroom recipes! ;-) Thanks for the comment. So true John, these are perfect for entertaining as they are very easy to prepare. I always serve marinated mushrooms as part of an antipasto platter when I have friends over for an Italian dinner. I agree with you about adding fresh herbs, I put a little fresh thyme in mine. Hi Anne, it's pretty easy to eat an entire batch of these. Before getting around to serving them. :-) Thanks for the comment. Hi Karen, fresh thyme is terrific in these! Thanks for the comment. My mother made these way back when but with canned mushrooms. They were not magical. They were scary. These are not! Thank goodness for I can finally see the light! Hi Abbe, I'll bet those were scary! Canned mushrooms have such a weird texture -- can't imagine this dish made with them. Well I guess I can, but -- to repeat -- it's scary! :-) Thanks for the comment. I also have a horror of canned mushrooms :-) Yours look lovely and, indeed, perfect for summer entertaining. Hi Amalia, these mushrooms are much better than canned. :-) Thanks for the comment. Hi Raymund, they're really hard to resist! :-) Thanks for the comment. Hi Amira, LOVE mushrooms! So good, aren't they? Thanks for the comment.